Hear of the extraordinary wonders God has worked through his most precious body and blood starting in ancient times: The healing of the sick, consuming the wicked with fire, the parting of water like Moses and the Red Sea, Military Victories against unbelievable odds and many more. These stories are taken from the writings of Church Fathers such as St Basil and St Gregory the Great, the testimony of Saints such as St Bernard and the annals of Church’s and other credible source. 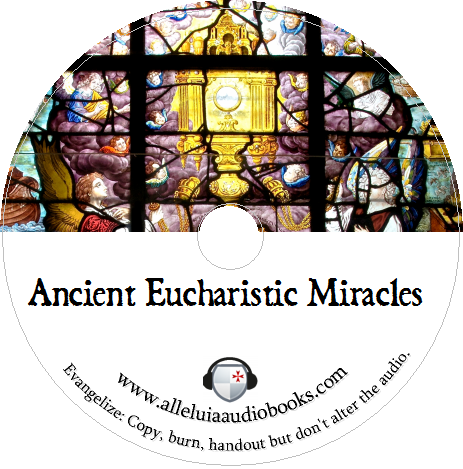 This Catholic Audiobook on Eucharistic miracles only discusses some of those Eucharistic miracles that range from 165 AD up till the 1400′s and also covers the mystical revelation that lead to the institution of the glorious feast of Corpus Christi. All of these readings are from the Legends of the Blessed Sacrament by Emily Shapcote published in 1877 are in the public domain . Great where would you like me to send them? How many copies would you like?